Ken Uston was born in New York City in 1935, his father being a Japanese emigrant and mother an Austrian emigrant. He graduated from Yale University with an economics degree and moved to study further to Harvard University to get there his Master of Business Administration degree. He was a very successful careerist and in the age of 30 years he was already a vice-president of Pacific Stock Exchange. This is the only occasion when such a young man became a vice president of such a solid company. It's already a mysterious moment and it's still unknown how Al Francesco and Ken Uston could meet. Someone says they met at the party and someone says they met at Ken's daily work - there are no concrete facts about it. This way or that, the Destiny brought them together and this meeting changed the world history of blackjack. Soon, Ken Uston quit his job and became a full member of Al Francesco's team. The team was highly educated and had a strong system of conspiracy which could hardly be beaten: team members were playing small bets on different tables in casinos. They were "counters" and they were not betting much: they were counting cards. And when "counters" saw that on some table the odds became really high, they called the "big players" who came to the table, made big bets and won big money. 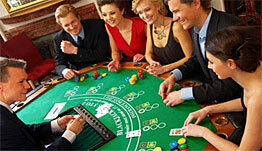 The income was distributed among all member of this professional gambling performance. In 1976 Ken made his own team which successfully gambled at Las Vegas and Atlantic City casinos. They won millions of dollars. And of course losses of such big money didn't make casino bosses to be glad. And one shining day Ken Uston was delayed by casino guards, and was forever banned to enter a casino. An interesting phenomenon - a master of blackjack may become a master of disguise. Ken Uston has proven it and became practically uncatchable and unrecognizable whilst being in the casinos. Still he used his casino-killing team techniques and won money as stable as ever before. Ken also struggled against casinos in court, and not only for himself, but for all blackjack players which were banned at the casinos. He stated that his card counting strategies were no any kind of cheating; they were just his attempts to use his brains, which were given to him by God. After long and persistent struggle, the New Jersey State Supreme Court agreed with his arguments and had forbidden the casinos to ban card counters. After this, casinos entered more decks, and it influenced negatively on the results of Ken's strategy, but new ways of counting appeared and still Ken Uston was one of those pioneers to research and to find out new strategies to beat casinos. Ken Uston published a lot of books and articles concerning blackjack, which helped novices and professionals to fight against casinos. Among them - "Million Dollar Blackjack", "The Big Player", etc. He died in 1987 year and now he is known as one of the blackjack heroes and original members of Blackjack Hall of Fame.